HONE CREEK, Costa Rica, Jul 24 2017 (IPS) - Jonathan Barrantes walks between the rows of shoots, naming one by one each species in the tree nursery that he manages, in the south of Costa Rica’s Caribbean coastal region. There are fruit trees, ceibas that will take decades to grow to full size. and timber species for forestry plantations. The tree nursery run by the Association of Organisations of the Talamanca Caribbean Biological Corridor (ACBTC), in the municipality of Hone Creek, is a helpful tool against the effects of climate change in Costa Rica’s Southern Caribbean region, because it provides specialised solutions for specific needs. Barrantes pointed out to IPS a group of saplings thirty centimetres high, explaining that this species native to the Caribbean basin, the cocoplum (Chrysobalanus icaco), is excellent for growing along the sea shore to prevent erosion, badly needed by beaches in this region. “This coastal area is touristic and there are many species that we human beings have cut with the idea of making it more attractive,“ says 36-year-old Barrantes. The nursery also grows teak (Tectona grandis) and beechwood (Gmelina arborea), two fast-growing tree species which are ideal for the forestry plantation systems encouraged in Costa Rica, and there is a row of saman (Samanea saman), which are perfect for reforesting river banks. With the association’s team, Barrantes and other experts have been for years growing thousands of trees to help cope with coastal erosion, sequester carbon, restore forests that prevent landslides and protect key river basins. In Hone Creek, more than 200 km southeast of the capital, civil society organisations from Costa Rica’s Caribbean coastal region, grouped in the ACBTC, are joining forces against climate change. As in the rest of the Caribbean region, this municipality in Costa Rica is suffering coastal erosion due to a rise in the sea level, which jeopardises the sandy beaches as well as the tourism-based economy of coastal areas. At a regional level, the Association of Caribbean States is carrying out a project to adapt to the new climate change scenario, in small highly vulnerable island nations as well as mainland countries, which have in common fragile economies and vulnerable communities. In Honduras, local communities are reporting changes in the geography of the coastline, and in Cuba scientists are racing against time to protect the country’s sandy beaches. It is a recurring pattern among Central American countries and each country is seeking its solutions. “While we work at a global level and expect international agreements to be respected, we have to start locally,“ biologist Julio Barquero, who also works with the ACBTC, explained to IPS. With a 200,000-dollar budget, provided by the United Nations’ Framework Convention on Climate Change Adaptation Fund, the ACBTC promotes a vision of a ”biological corridor” from the forested mountains to the sandy beaches. It encourages farmers in hilly areas in the municipality to incorporate their forest lands to the Payments for Environmental Services programme, by which the Costa Rican government provides economic compensation for protecting the forest cover. Under this programme, 478 hectares have been protected in the key Carbón River basin, which brings benefits to the communitiesalong the lower stretch of the river. “When it rains a lot in a short period of time and there is no vegetation cover, the water does not filter down into the ground but washes the surface away,“ explained Barquero. Along the coast, the work starts with the defense of the coastline. In the Gandoca – Manzanillo National Wildlife Refuge, the Association facilitated the reforestation of 25 hectares of coastal wetlands with red mangroves, which protect the coastline from storm surges. “Each time there is a storm, the coastline gets more damaged by the rising sea level,“ said the biologist, who pointed out that life in the town revolves around the sea. Hone Creek is part of the Cahuita district, in the municipality of Talamanca, in the southeastern province of Limón. The United Nations Development Programme (PNUD)’s Human Development Index ranks Talamanca in the second to last place among the country’s 82 municipalities. The economy of Talamanca, which boasts rich biodiversity and has a population of less than 400,000 people in its vast territory, depends largely on tourists who come to enjoy the coral reefs, tropical forests and sandy beaches. One of the main tourist attractions is the Cahuita National Park, which has suffered heavy coastal erosion along its 13.5 km of coastline. “This directly affects tourist services, because the trails that link the different parts of the park run along the coast and are very vulnerable,“ Marco Sánchez, the park’s tourism operator, told IPS. In 2016, this protected area received nearly 100,000 visitors – more than double the 40,000 inhabitants of Talamanca. “It also affects the reef, which is an attraction that draws many tourists, and the sea turtles who are losing space in their breeding areas,“ said the official. 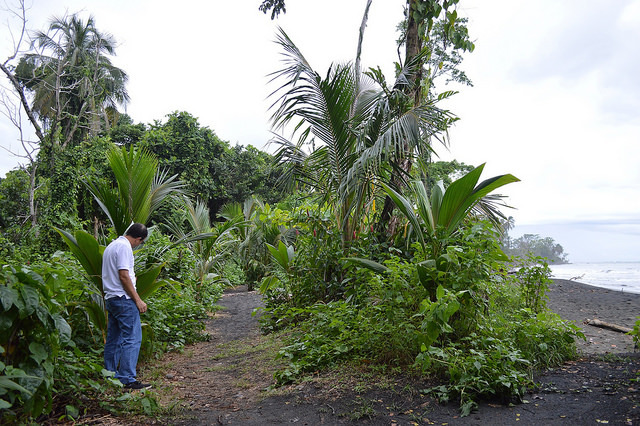 To recover the coastline, by means of a joint effort between the Cahuita district, the park officers and the Association’s team, hundreds of palm, noni (Morinda citrifolia) and other species of trees were planted. While trees are being planted, the park’s authorities are studying more actions to be carried out to adapt to climate change. For example, the state National System of Conservation Areas is currently evaluating transferring the park’s administrative area several km inland from Puerto Vargas, to avoid the impact of the waves. Currently it is just 150 metres from the shore. 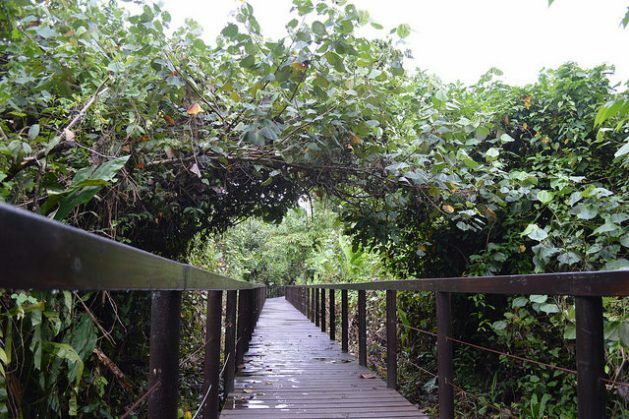 Also, as part of the Sustainable Tourism programme agreement that Costa Rica signed with the Inter-American Development Bank, the Cahuita Park received 1.8 million dollars to improve the infrastructure of its visitor centre. One of the measures taken was building a flyover through the coastal forest, connecting the beach with the road that accesses the park, along a route that avoids the coastline. Although its intention was to highlight the biodiversity in this area of the Park, it also served as an adaptation measure: before the flyover was built, the only point of access to the beach was the road that runs parallel to the coast, which floods regularly with the high tides. “When we have had to close this sector (the beach of Puerto Vargas), it was because there was no access. That was the only route; now we have another option,“ Mirna Cortés, 38, the Park’s assistant manager, told IPS, proudly. The park officers as well as biologist Barquero hope the community will lead the actions in the area, and are organising awareness-raising workshops on climate change to that end. By the time the programme financed by the Adaptation Fund ends, the ACBTC expects to have trained nearly 1,500 people to defend this vulnerable area from the ravages of climate change. I applaud the efforts & concern, but I question the planting of non-native species (teak, beechwood, noni). The local ecosystem has co-evolved for millennia with the other plants & animals that have lived there for millennia. Introduced species have wreaked havoc on ecosystems worldwide.